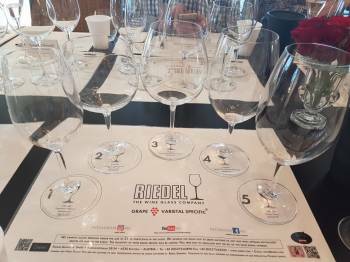 I’d attended a Riedel glass tasting before (and heard others’ experiences) and knew that again I’d come away fully convinced of the genius of this glassware designed to bring out or suppress characteristics of different wines – tannin, perfume, greenness, etc, etc. Fully convinced, that is, that the shape and dimensions of a glass can make a remarkable difference to the experience of drinking wine. I say “experience of drinking wine” rather than “taste of wine” – and I’ll come back to that. Convinced I was, unquestionably – but will it make me buy some Riedels? (I have a random few Riedels, but mostly drink at home from my feather-light, one-size-supposedly-fits-all Gabriel glass.) This time I might just pay up, though I’d like to match one or two of them against my present glasses. The first time I went to one of these tastings, it was conducted by George Riedel himself; this time the leader was Riedel’s South African importer of the glasses, Michael Fridjhon, so the quotient of humour, charm and wit went up substantially. The most interesting glass for me this time, partly because I’d not met it before, was one in the Vinum range, designed expressly for oaked chardonnay (around R690 per pair) – near-spherical, with the top cut off to give an unusually large mouth. Almost like a larger version of the dreaded Paris Goblet, in fact. The chardonnay offered was the appropriately oaky Louis Latour Grand Ardèche 2014. Oaky to the extent that a few of us, including me, rather preferred it from the glass designed for unoaked sauvignon blanc, which suppressed this character – though I admit that some more pleasing characters were also suppressed. Discussion ensued, and, to let us try the effect with a local wine, a bottle of Richard Kershaw Clonal Selection Elgin Chardonnay 2016 was procured (without trouble, as this was all happening in a private room at the impressive and posh new Silo Hotel on CapeTown’s Waterfront). No question here: in the sauvignon glass, the Kershaw was a very pleasing and good wine, but in the Oaked Chardonnay glass it revealed its richly elegant, refined brilliance; the oak apparent as it should be in such a youthful wine, but subtly and integratedly so (it’s a much finer wine than the French one – and twice as expensive). I’m not much of a chardonnay drinker but – pending my test against my customary glass, if possible – I feel pretty sure that I should never drink the stuff out of anything else. Oh dear. In most cases (as for the chardonnay) there are undoubted aromatic benefits to the Riedel glasses appropriately used, but the thing stressed by the manufacturer is how the wine is “delivered” in the mouth: that is, especially, what part of the tongue the wine is designed to ineluctably land on. Disconcertingly, one must realise, though, that this landing point quickly becomes irrelevant, as the wine quickly washes all around the mouth. It’s also disconcerting to recall, as has been well established now, that the role of the tongue’s tastebuds is strictly limited with regard to what we call “taste”: just about all flavour (as opposed to some other aspects of a taste experience) is really aroma, reached by the nose and the retronasal passage at the back of the mouth. After which it’s up to the brain’s olfactory bulb. So it’s never been quite clear to me how this undoubted Riedel effect works. Clearly – I realised this time – the first few instants of the palatal experience are vital to the final expression of the wine. Crucially prepared for, no doubt, by the aromas. That initial impact and effect must necessarily be a fleeting one, but somehow colour the drinking experience. This is something which I don’t recall seeing discussed in such studies as Jamie Goode’s I Taste Red (which I reviewed here), but I can’t see how that conclusion is avoidable. The bit of the Riedel effect I still have difficulty with is that it’s now established that the tongue doesn’t really have, as was long thought, different areas “specialising” in sweet, sour, bitter, sweet and – arguably – umami. So why is it so significant, as it seems to be, where the wine initially lands? Nonetheless. It has always been clear to experienced tasters that, when tasting blind, it’s generally best to trust one’s first impressions. Only too often one is ruefully reminded of this when getting an identification wrong, having been led astray. My Riedel tasting and observations arising from it seem to help me understand why. I have a few Riedels at home that I swear by. I also don’t understand how it works.It probably is mostly in the olfactory experience. I think the area of the palate it sends the wine to is difficult to swallow. Lets face it no one gapes the hatch wide enough for wine to be funneled to a specific area. Surely the turbulence created at point of entry (lips) sends the wine to all corners? Thanks for the agreement, Bernard! But the funneling does work, at least initially and up to a point. The Riedel tasting experience starts with sipping very cold water out of each of the glasses, which allows the mouth to sense which part of it gets hit first. For me it was clearest in one glass which delivered the liquid right to the back of the mouth/tongue. Later, tasting a cabernet-based wine from that “wrong” glass made it seem much more tannic (though tannin astringence is something I tend to feel more on the cheeks). From the “right” Bordeaux glass, the tannins were much more harmonious. Frustrating, but true!